As a Reiki practitioner, do you ever feel resentful after giving a Reiki treatment, as if something is not quite balanced? If you are a Reiki professional, are you ever uncomfortable charging for your services or setting fees? HOLY MONEY is a 3-week online, at-home program that clarifies your understanding of money and value, especially as it relates to your Reiki practice, and your comfort sharing Reiki informally or as a professional. do all the above with grace and ease. And in the comfort of your own home, whenever you have 15-20 minutes in your day. Sounds great, but how will all that happen? HOLY MONEY is a unique combination of Reiki free-writing, mentoring and community in a flexible structure that adapts to your schedule and maximizes your benefits. You start by (quickly) learning the skill of Reiki free-writing (it’s very easy), and continue to free-write at home on your own schedule. I suggest 15 minutes a day but it’s up to you. Any Reiki practitioner can Reiki free-write. You do not have to be a writer. You need not be able to spell. Grammar doesn’t matter. And you can write in any language you choose. Only you will read your free-writes, so you can safely use your writing to explore any confusion you have and discover your clarity and insight. If you participated in WRITE REIKI, you already know how effectively Reiki free-writing reveals unresolved emotions and biases, and helps you heal, and makes you more confident, and more consciously creative. HOLY MONEY is a soft structure in which you explore money as a meaningful, playful, powerful and creative merging of spiritual practice and your daily life — instead of the head-on collision it so often seems to be! HOLY MONEY starts on a Friday and ends Thursday evening three weeks later. For the first two weeks, I will provide you with prompts and articles written specifically for HOLY MONEY. You will share your daily free-write experience and insights — but not your actual free-writing — in our private online Writers’ Haven. I will be online many times each day to support you. The third and final week is your time to catch up or revisit prompts, or free-write from prompts you come up with, while continuing our online discussion and support. We have an online call a week into the program to discuss any questions you have about the program subject matter. Be live if you can, or submit your question before and listen to the recording. I’ve noticed nothing stops spiritually-minded people like their own (mostly hidden) attitudes about money. Don’t you want to unlock your power to help others by bringing Reiki practice to more people? Maybe even explode your power to do that? Imagine that, an explosion of grace! If you enjoy HOLY MONEY, you will have the option to continue with SACRED BUSINESS, in which we will explore ethical, effective business practices and growth strategies. But first things first: there is no sense talking about business growth strategies if you are still confused about money. First let’s clear the land, then we can plant seeds. 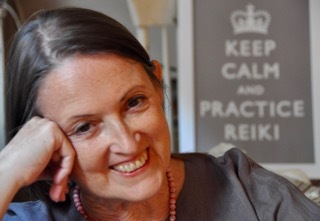 Pamela, deep thanks to you for your commitment to us as Reiki practitioners and to the practice of Reiki. Holy Money and Sacred Business have taken my free write experience to greater depths, exploring my experience, untying old knots & assumptions, revealing what’s alive in me. I appreciate the fees for this series of workshops. You’ve made it very possible for us to participate. The articles have been brilliant: practical, thought-provoking and motivating. I still have pieces I haven’t finished that I’ll continue to work on. I’m very grateful for the Writer’s Haven and everyone’s commitment to participate. It’s been a joy to be with practitioners from diverse Reiki styles and traditions, focused on our shared needs and goals. I have thoroughly enjoyed this program, and am really grateful for all the insight and knowledge I’ve gained, through carrying out the program and through your guidance Pamela. Sharing with others in the Writers Haven has been a real pleasure. You brought together a wonderful group of people. HOLY MONEY/SACRED BUSINESS has been illuminating. A lot of deep work took place through the prompts and my free-writing, and the articles. My eyes opened to a different way of looking at experiences and thought processes. Pamela, thank you for offering this program. Your articles were off the charts helpful! I am still going deeper into my practice with them. With the effort I was willing to put into the program, you were willing to meet me there and take it up a notch, allowing me to push myself (rather than feeling pushed). And thank you to my fellow writers. You inspired me to look at things differently, think of things in a different way, and I totally enjoyed the company of each of you! Is this opportunity your opportunity? No opportunity is right for everyone at any given time. If you are satisfied with your status quo, take a pass. If you’re not satisfied with how many people you are able to help, let’s talk empowerment and transformation. want to frolic in the fields of prosperity (just had to add that!). If any of the above applies to you, why would you hesitate? Profound healing and empowerment waits for you in this program. But nothing will change unless you make a commitment to change and invest in yourself. I am committed to supporting your continuing growth. Together, let’s ensure that diverse thoughtful, credible approaches to Reiki practice remain accessible to the public in the future, even more accessible than they are now because you’ve been empowered to step forward and share. Your confidence, clarity and success matter to me, as that is the only way we can fulfill Hawayo Takata’s dream that Reiki become as common as aspirin. Make a smart choice that will pay powerful dividends in your personal and professional life. Empower yourself to represent Reiki practice with respect and credibility, and live directly from your authentic creative power. Please click here if you would like to be informed when the next HOLY MONEY online program begins.